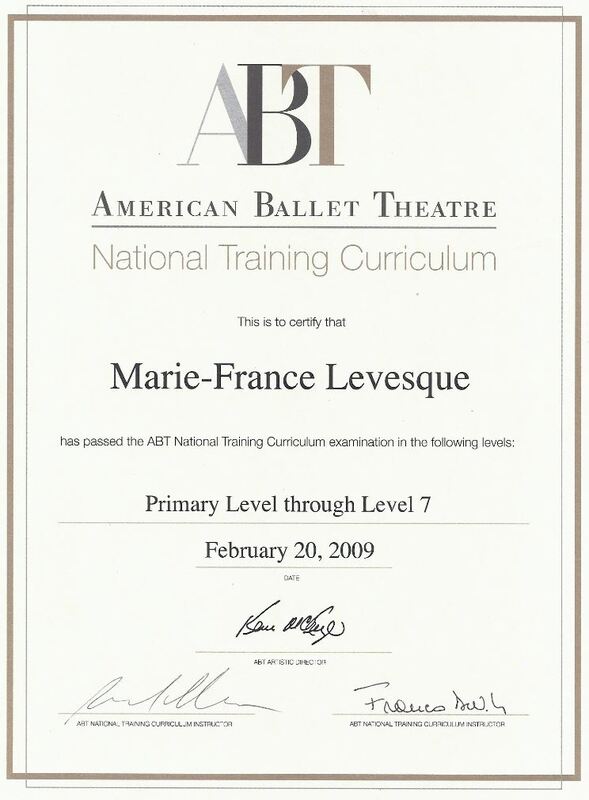 Marie-France has been teaching and remains teaching the highest level of professional instruction in classical ballet extensively since 1996 in group classes, master classes and privately at Universities and Dance Studios in Southern California such as: California State University Long Beach, Moorpark College, Westside School of Ballet, Southland Ballet Academy, , California Dance Theatre, Pasadena Civic Ballet, Agoura Hills Dance & Performing Arts Center, A Step in time School of Dance, and the list goes on. Marie-Fra nce is a certified teacher for the American Ballet Theatre’s newly developed and nationally recognized training curriculum in all their Levels. In 1982, Marie-France received an Associate Degree in Dance and Music from the Cegep-du-Vieux-Montreal College in Canada and she has since expanded her education in Business at Hunter College (NYC), Santa Monica College and Pierce College. She was awarded a grant form the Canada Council and one form the Quebec Government, as well as several AGMA and “Dance On” scholarships. Marie-France is dedicated to provide excellence in classical ballet training and to develop the individualized artistry in each student in order to prepare them to go on to professional schools and companies. She offers a supportive community in which students can learn the discipline of classical ballet, whether or not they have professional aspirations, they can carry it on and apply it to everything else in their life.